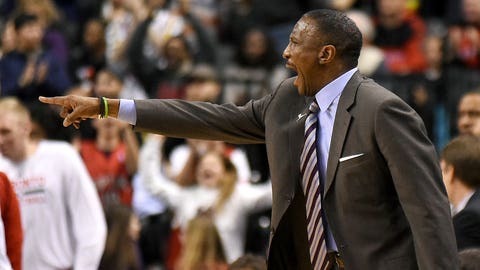 Even after consecutive playoff appearances, Dwane Casey's days with the Raptors could be numbered. In many ways, 2014-15 was a success for the Toronto Raptors. The team made the playoffs for the seventh time in franchise history, although they came up short in the Eastern Conference's first round. That was a continuation of a late-season swoon for the Raptors, who had gotten off to a hot start and had some league observers wondering if they might be a contender to take on LeBron James' Cavaliers in the Eastern Conference finals. The bit about the assistant coaches might not seem like much at first glance, but it's a big deal. As Steve Kerr demonstrated in leading the Warriors to a title in his first year as a coach, assistants matter quite a bit. It's paramount that a coach be comfortable with his staff and that the coaches work together to help a team be the best it can be. If the Toronto front office is making suggestions on assistants to Casey, it could be an indication that they lack confidence in him going forward. Casey has done good work, but Toronto embarrassed itself in the playoffs last season, and the team gutted Casey’s staff of assistants for the second time in only a few seasons. They brought in Andy Greer, a Thibodeau staffer in Chicago, to revamp the defense, and before landing Greer, they made a hard run at another defensive guru, per league sources: Darren Erman, Jackson’s former assistant in Golden State, and now the associate head coach in New Orleans.